Finally, spring has arrived. We’ve survived another Nebraska winter and have done every indoor chore on our “to-do” lists. Our gardening tools are ready; some seeds have already been started in our basement greenhouses. All we’re waiting on is the weather, specifically warmer air and soil temperatures, to launch our season. What else can we do while we wait? Well, now is a good time to build a raised planting bed. There are some key considerations when selecting a site for a raised bed. A flat, level area works best for a raised bed. If there are specific plants you want to grow, make sure you’ve located your bed so it receives the correct amount of sunlight. Having a water source close at hand is important. A raised bed will dry out more quickly due to improved drainage and quality soil so you’ll want to minimize the distance you have to travel with a hose or other irrigation device. Another important component in selecting the location of the bed is its size. The point of raised bed is to avoid soil compaction, i.e. all weight-bearing activity such as walking, kneeling, and wheelbarrow placement occurs outside the bed boundaries. By not stepping in the bed, soil remains light and fluffy and keeps your plant’s roots happy. If you will have room to work on either side of the bed, a four-foot width is ideal. When prepping your site, you will want to remove the existing sod. There are two ways to do this. If you want to skip your workout for the day, grab a shovel and dig out the sod and loosen the soil with a shovel or garden fork to a depth of 8 – 12 inches. A less labor-intensive alternative is to lay down newspaper or landscape fabric, effectively smothering the sod. Raised beds can be constructed from a variety of materials and are a matter of personal preference. Treated lumber should be avoided as it can leach hazardous chemicals. Cedar and redwood will resist rotting and are good alternatives as are stones, cinderblocks, and bricks. Once the frame has been constructed, fill it with a good mixture of quality topsoil, compost and rotted manure to a minimum depth of six inches. To ensure the plants’ roots have ample room to grow, a depth of 8 – 12 inches is ideal. Rake the soil mixture level and you are ready to plant. If you have raised beds as part of your landscape or if you build a raised bed this spring, send us a note and let us know about your experience. As always, we love to see pictures of your projects, so we hope you’ll send us those as well. Spring is just around the corner and green thumbs everywhere are getting the itch to get out and dig in the dirt. We can only peruse seed and plant catalogs for so long before the dirt calls our names. What can we do to satisfy the planting craving? We can plant potatoes indoors! This is a great project for the whole family, including those budding gardeners who, by now, are bored with all the usual indoor winter activities. With the exception of the initial cutting of the potato, this is truly a kid-friendly project. To get started, you’ll need a few simple supplies: a deep pot, some potting soil and, of course, a potato that has begun to sprout. Cut the potato into sections with one or two eyes (sprouts) each. Make sure each section has enough “meat” with it. The potato will probably be soft, but should not be mushy or rotten. The sprout will use this portion of the potato to feed on until it begins to grow roots. Fill a deep pot 1/3 full with potting soil; place the potato section atop the soil and cover with three additional inches of soil. Water the potatoes and place them in a warm, sunny area. Soil should be kept at room temperature. The plant will require about 14 hours of sunlight daily so, if you don’t have enough natural light, florescent lighting is a great supplement to natural light. Keep the moisture level consistent. It is possible for a potted potato to suffer from drought which will yield a lumpy spud with a strange texture when cooked. When the plant is six inches tall, add 2-3 inches of soil. Continue to add soil as the plant grows until the soil level is about 3 inches from the top of the pot. Once the plants have flowered, the greenery will begin to turn yellow and die back. Stop watering at this point to allow the potatoes to mature. Overwatering at this stage can make the potato mushy. 'Baby' potatoes may be harvested 2-3 weeks after the plant flowers. For larger potatoes, wait 2-3 weeks after the tops of the plants have died back. Using your hands, a small shovel, or a large spoon, carefully turn the tubers up from the dirt. “New” potatoes may be washed and eaten immediately. If you plan to store your potatoes, spread them out, unwashed, across the top of the soil for 2-3 days to allow the skins to thicken. You should plan on two to three months from planting to harvest so your potatoes may not be ready for Easter but should be a hit for Memorial Day. We’d love to see pictures of your DIY spud projects so please send them in. Potato foliage peeks through the top soil. 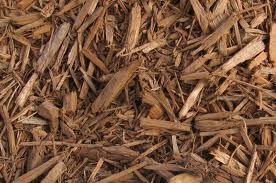 Mulch in itself is material that is spread out over and around the roots of what you have planted. 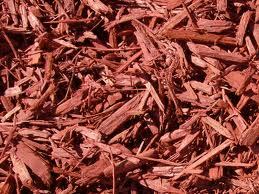 Two types of mulch are organic and inorganic mulch. Organic mulch includes grass clippings, leaves, bark mulch, newspaper and straw like pine straw. 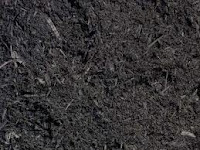 Inorganic mulch includes various types of rocks, stones and gravel. The advantage to using organic mulch is that overtime it breaks down and adds nutrients to the soil, thus making the soil richer. However, because it eventually decomposes, organic mulch will need to be replaced from time to time. When applying mulch you want to put a layer of it 2-4 inches as close to the roots as possible. Remember to replace the mulch as needed if using organic materials. Make sure you don’t use too much as too much of it will be a bad thing possible causing the roots to suffocate. You also want to make sure you keep any mulch away from tree trunks. Organic mulches are very beneficial but they can wind up being a habitat for insects. Most of these insects will not harm your plants but they may become a nuisance for you. Keep this in mind when using organic mulch close to your house. Pavement ants are known to love bark mulch. If put too close to your house you may have unwanted guests. Some people like to spread out a layer of plastic underneath before they apply mulch. This isn’t a good idea because it dries out the soil underneath defeating the purpose of maintaining proper moisture for the root system. The best time to apply mulch is in late Spring once the ground starts to warm up. As a final mention on using mulch I can’t emphasize enough how it can improve the aesthetics of your landscape. Whether you use colored bark mulch or beautiful colored rocks, it will really make your yard pop. It is well known that beautifully landscaped yards add to the value of your home. Welcome to our first installment of Tools of the Trade. Periodically throughout the year we will highlight some of the tools that we use in our industry with pics, what it is, what it's used for, the importance of the task that it is used for and any pros/cons versus using a different tool. If you have any questions about the tools we are highlighting or you would like to see us do an article on a specific tool, please leave a comment and we will answer it. Not much landscaping going on during this time of the year, however snow removal is in full swing. What better tool to talk about than a snow plow. 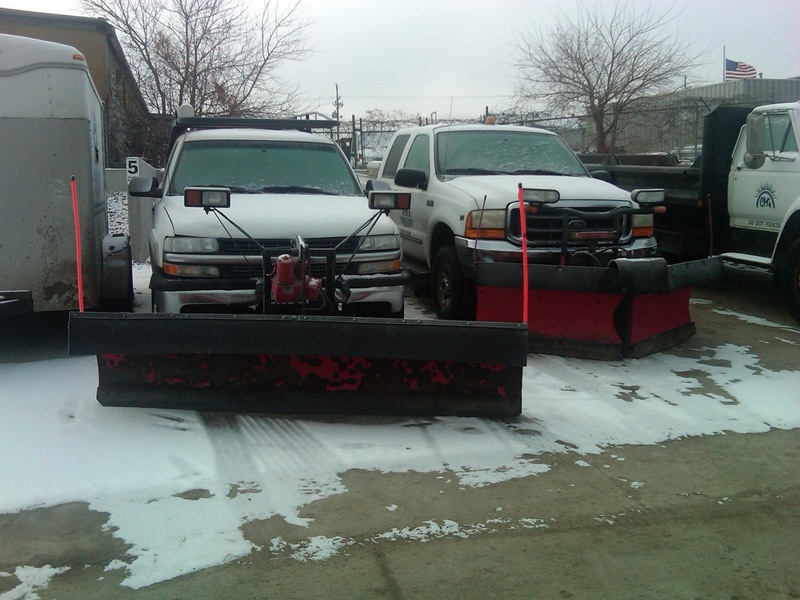 There are two types of plows that we use- straight blade and v-blade. Both types can be mounted to the front of a truck in about 5 minutes (once the mounting frame is "permanently" attached to the frame of the truck). Straight blades are the old trusted stand-by. They are great for clearing large parking lots where you can windrow the snow to one side of the lot or the other. They are also ideal for back-dragging snow away from buildings or residential garages. Some straight blades have a small secondary blade on the back side of the plow to aid in back-dragging. With both straight blades and v-blades you can either get them in the standard steel or polycarbonate material. With the poly blade, you don't have to worry about rusting and they are a little bit lighter. Straight blades are also made for larger equipment as well. 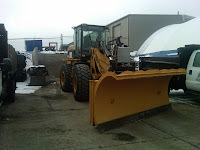 We have several bigger pieces of machinery that we run either blades or snow pushers on. 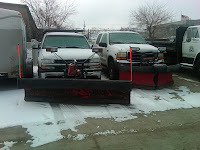 The snow pusher looks similar to the attachment on the right. It is essentially a box with one side missing. The pusher is great for clearing large sections of parking lots as it holds a lot more snow than a v-blade can. The v-blade is a better option for "containing" snow than the traditional straight blade. With the v facing fully to the front you can collect snow and leave less of a trail as you plow. This is ideal when doing final clean-up on a property or when you are needing to clear snow straight from one end to another. The v is very versatile as it can also be used as a straight blade for wind-rowing larger lots. With the v fully retracted back, it works well to make the first pass through a deep snow as it acts just like a cattle pusher on the front of a train. It clears the snow off to both sides of the truck. Regardless of the plow used, they are controlled by some type of hand controller inside the vehicle. 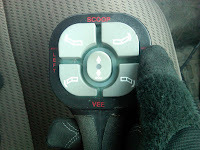 The two controllers to the right are the two most common for v-blades. It comes down to personal preference on which type snow fighters use. The top one can be mounted to an armrest, center console, or straight to a seat. The bottom picture is one that straps to your hand or when partially dis-assembled can be mounted to your dashboard or leg with a few modifications. If you zoom in on the picture you can see the various functions they control. The control for a straight blade (not shown here) is much simpler. It is typically a small box that can be mounted just about anywhere. It is a small joystick that controls left, right, raise, lower. 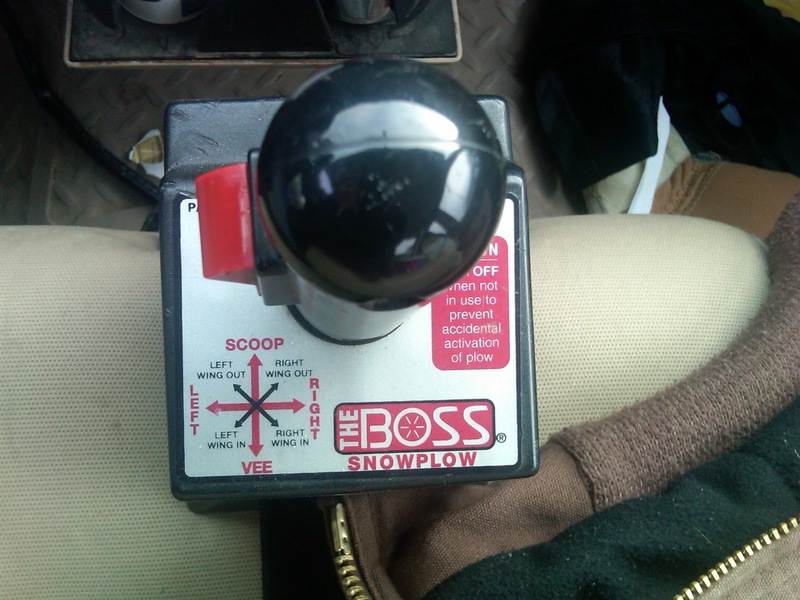 This was a very brief run-down on the snow plows that we use. 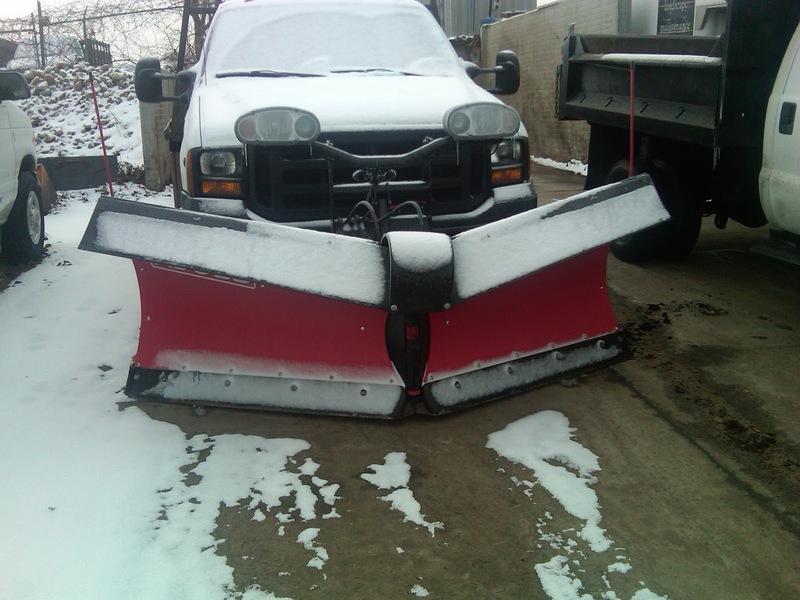 There are many variations of these blades as well as accessories that you can purchase that can aid in snow removal as well. If you have any questions in regards to snow plows, please leave a comment below and we will answer it. The temperatures are getting colder and the days of rain will soon be turning in to days of snow. Time to put away the lawn equipment and pull out the shovels and test out your snow blower. Before you put away your landscape equipment, it is a good idea to winterize them to ensure a longer life and make sure they are ready for your return next spring. Here are some helpful tips/ reminders brought to you by John Fech, a UNL Extension Educator. Clean and sharpen garden tools before putting them away for winter to minimize rust and ensure that they are ready for use in the spring. Remove soil, rust and other debris with a wire brush or steel wool. It may be necessary to dissolve accumulated sap and resin on some pruning tools with a solvent, such as kerosene, and to loosen the pivot bolt and separate the blades. Position the tool, using a bench vise or clamp if needed, so you can put the proper bevel on the cutting edge with a flat file or whetstone. Remove any metal burrs from the backside of the cutting edge with 300 grit wet/dry sandpaper when sharpening is completed. Finish with a light application of good quality oil to prevent rusting. As you prepare your lawn mower and other tools for winter storage, don't forget to winterize your sprayers and fertilizer spreader. Smooth, dependable pesticide application next summer depends largely on the care and maintenance that sprayers and spreaders receive over the winter. Since the "pest season" is about over for this year, this is a good time to winterize your equipment. Apply oil to the bottom of the hopper and all moving parts. Store the spreader with the shutter or gate fully open. Compressed air sprayer tanks should be filled one-fourth full with mild dishwashing solution. Shake the sealed tank to loosen any spray residues. Pressurize the tank and spray out the water. Drain the tank upside down until thoroughly dry. Once dry, place a few drops of oil into the top of the pump cylinder. Pump the cylinder several times to coat the cylinder and valves with an oil film. Reassemble the sprayer before storing. Nozzle tips and screens should be removed and cleaned with soapy water. Clogged nozzle tips should be cleaned with a sliver of wood or other soft object, not with wire. An old toothbrush, properly labeled as being meant for pesticide use and stored with the sprayer, works very well to clean spray residue and other deposits from nozzles. Store nozzle tips and screens in diesel fuel or kerosene to prevent corrosion. There are many options for indoor flowering plants throughout the winter. Nearly every bulb variety can be “forced” or tricked into believing it is spring and time for them to shine. Paperwhite narcissus bulbs are great for forcing indoors because unlike many bulbs, they do not require a cold treatment. It usually takes only 3-5 weeks to see blooms from the time they are planted. The fact that they don’t require soil means minimal mess in the house, unless Tobias is “helping.” This is a great project for little ones so don’t hesitate to get them involved. Like all projects, gathering your supplies and tools ahead of time lays the groundwork for a successful venture. You’ll need a container without a drainage hole, a filler medium, water and, of course, bulbs. That’s it. It can’t get any easier. Are you ready to get started? Select high-quality bulbs that are free of mold and mildew. For our purposes, we selected paperwhites which require no chilling. Amaryllis is also an option for the following process. The ideal container is 3”- 4” deep. 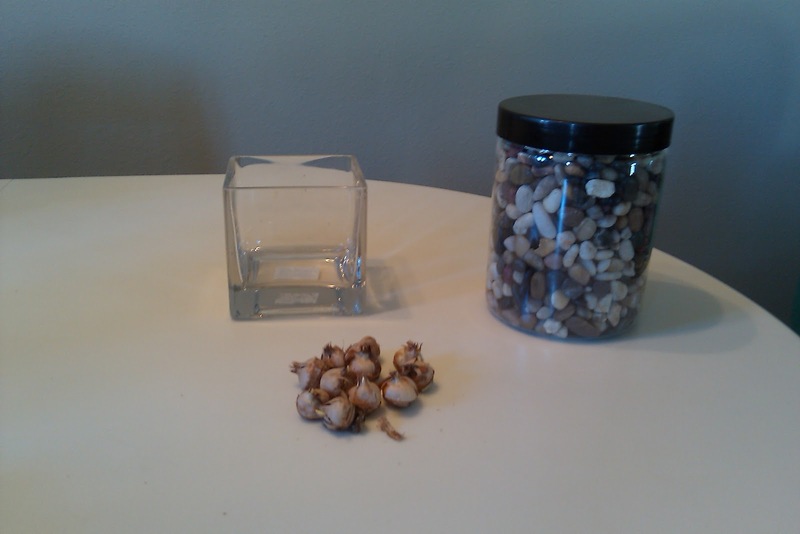 While any container without a drainage hole can be used, a glass container is preferred, especially for first timers and children. A glass container allows for easy monitoring of the roots and eliminates any guesswork when it comes to deciding when to move the container. There are a variety of materials that can be used as filler. 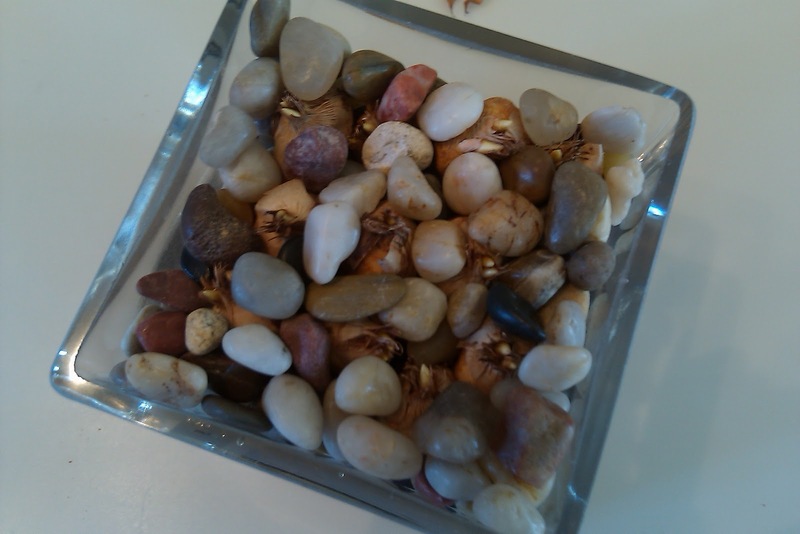 Pebbles, crushed rock, marbles, etc. are all good choices. The purpose of the filler is to provide stability and support for the plant as it grows. The filler should be made up of fairly small pieces so that the roots can fill in around them. Spread 1-1/2” of filler in the bottom of the container. Set the bulbs, pointed side up, in the filler and use the remaining filler medium to support and fill in the gaps around the bulbs. Leave the tips of the bulbs showing above the filler. Add enough water for the water level to reach the bottom of the bulbs. For those of you who have been waiting for the “trick” to begin, here it is. You will need to find a dark, cool place for the plant to hang out for a few weeks. The ideal temperature is 55 – 65 degrees F. The plant believes it is winter and will start sending out roots. It usually takes about 2 to 3 weeks for the roots to begin developing. When you can see the roots and the top of the plant begins to elongate, it is time to move them into the light. Find a sunny spot where the plant will be tricked into thinking spring has sprung. The more sun the better, but remember: the point is for the plant to think it is spring, not summer, so watch out for the temperature. After about one week, you will begin seeing several buds on each stalk. To prolong the growing season, stagger your planting over several weeks. This will provide you with beautiful plants throughout the winter months. 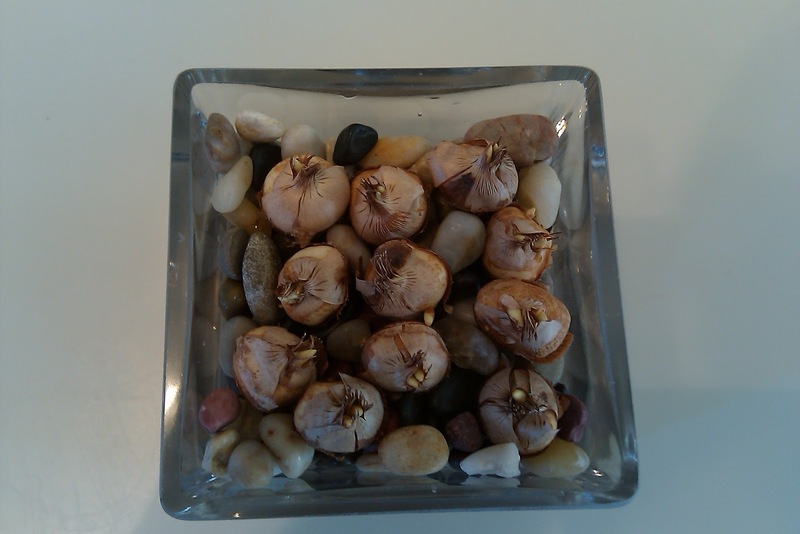 While it is not advisable to mix bulb types in a container, give serious consideration to starting a variety of bulbs to take advantage of the full array of colors these plants can produce. Once you are comfortable forcing bulbs like paperwhites and amaryllis, consider the other spring beauties: tulips, daffodils, hyacinths and the like. These cold-treatment bulbs require more time and a bit different methodology, but are certainly worth the effort, especially in the dreary, cold winter days of January and February. If you are interested in learning more about forcing cold treatment bulbs, let us know. We wish you the best of luck with your planting, whatever the season. The trees are dropping their leaves and it is important to prevent a heavy layer of leaves from building-up on your turf before winter. Heavy layers of tree leaves that shade the grass can smother and kill grass yet this fall. Plus tree leaf cover favors snow mold, which should still be fresh in our mind from last year's damage. If you choose not to compost them on site, the easiest way to dispose of leaves is to simply mow them in to the turf. Cool-season turfgrasses require mowing well in to the fall anyway, so regular mowing during the fall will chop the leaves in to small pieces and allow them to filter in to the turf. Research at Purdue and other Midwestern universities shows that tree leaves can be mulched without any detrimental effects on the soil or turf. Actually, just the opposite may be true where tree leaf mulching may help improve the soil and/ or turf. - Minimizes waste in landfills. 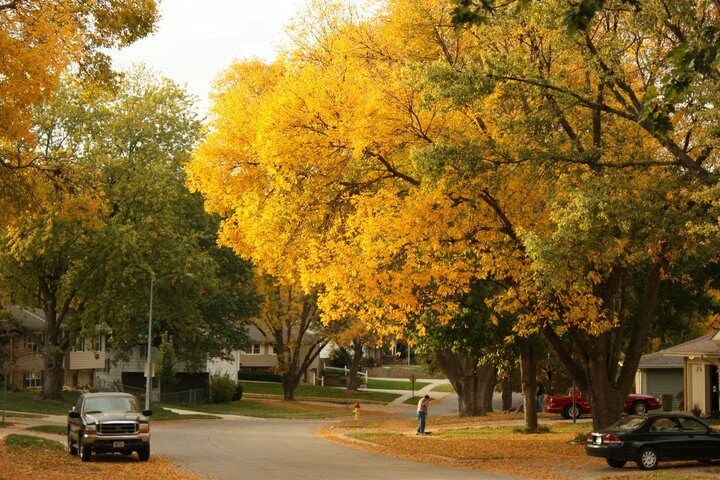 - Reduces municipal costs for leaf pick-up and disposal. - Improved water infiltration in to the soil. - Helps reduce a source of phosphorus in our surface waters. A number of studies reported total P in urban runoff is highest in fall at the time of leaf drop. Tree leaves moved to the streets could leach phosphorus, which could move in to the storm drains and eventually in to rivers and streams. Keeping them on the turf will allow for better absorption of leached phosphorus. - May help reduce broadleaf weeds on very low maintenance areas.